Will was not, after all, expressing his feelings for the older woman he married in a hurry and left asap to pursue a career in London. He wasn’t a miserable tightwad either. Having lost his son Hamnet when the child was 11, and being estranged from his daughter Judith who had married unwisely, he was laying his money on Susanna to produce a male heir. Didn’t work. Susanna had a daughter who married twice but had no children. Judith had three sons but none survived to produce children. Pas de heir! Whew! Good to get that settled. We all have experience of the second-best bed – at holiday time, on vacations, in cheap hotels, as children at grandma’s – the deep-valleyed ones, the plastic pull-out couch, the couch itself, the hard-as-cement beds, the mat on the floor. We have stubbed our toes on the metal legs of the pull-out and ruined our backs on the ones with blown springs and woken up aching all over in the hard ones. Our host’s query “How did you sleep” has been met with a bald-faced, not entirely convincing lie. Or we have found ourselves in the best bed, a comfortable place to be, and discovered in the morning that the host and his wife somehow managed to coil together in a narrow cot. Discovering such a carefully concealed secret is a humbling experience. These days, we have boxed beds that can be blown up with an all-included foot pump and provide our guests with a waterbed experience, long after the death of waterbeds, which was, as you know, watery and unexpected. Whether these air beds leak with rude noise in the middle of the night, I do not yet know. My own second-best bed sits in the den, rather awkwardly I must admit, because of feng shui demands. It is narrow, has a metal frame on casters and no headboard. It is prone to surprising trips across the floor. In its defence, it has a good mattress -should be for that price- if somewhat too hard. When I realized that I would be sleeping in it myself, I remedied that by topping it with a feather bed. Odd that we think a night in a semi-comfortable bed won’t hurt a guest, but don’t want to spend one ourselves. Then I decided that the thread count of the sheets had to be upgraded to the best bed’s standards and a requisite number of pillows added. 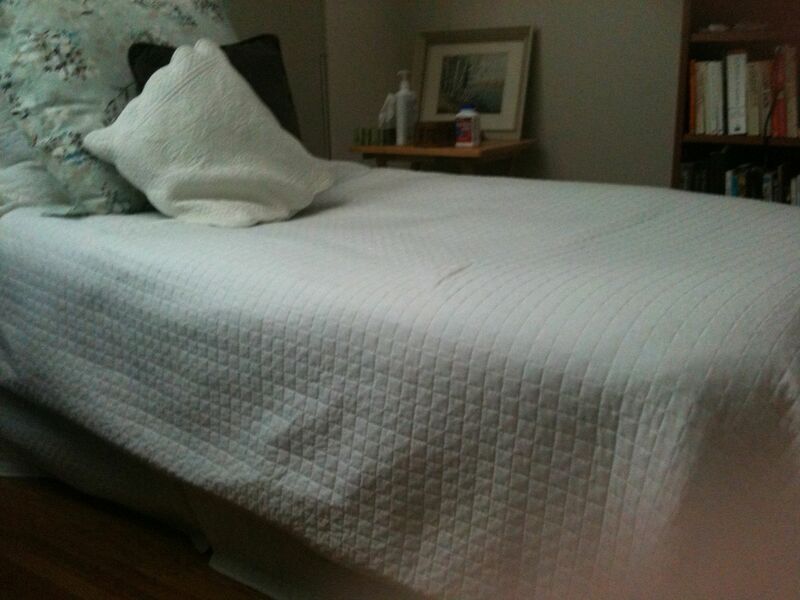 I overdid the duvet and find that it works well in mid-winter but after that, the quilted duvet cover is enough. And why do I sleep in my second best bed about a third of the time. Neighbours. Thin floors. Don’t ask. There’s only so much I want to know about other people’s personal lives. I’ve got used to sleeping there and never wake up disoriented, wondering why things are in the wrong place. This is handy since those mandatory trips in the dark would otherwise prove disastrous. One of the advantages is better brain plasticity. Thanks to Norman Doidge (The Brain That Changes Itself) and others, we now know after years of being told that once brain cells die, it’s game over, that in fact new neural pathways can be established and for example, stroke-damaged limbs can learn to move again. To maintain neural plasticity or brain change, however, we need to be learning constantly. One of my tai chi instructors harps on about moving your kettle to a different burner to avoid rigidity and stagnation. The kettle, in this case, is me and the new burner is the second-best bed. Twas there “I dreamed the latest dream that ever I did dream”. It wasn’t a police procedural with noir overtones nor was it a lucid dream. (See previous posts.) But it was one of two dreams that have been life-changing. Someday I’ll write about the first one, which I call Etherica and which I had while napping after an exhausting trip to Los Angeles. The latest one isn’t ready for publication yet, but I can give you the highlights. It was suffused with love, the kind of love that I felt as a young woman for Blake, my high school sweetheart whom I married, and which I saw reflected in my grandson and his fiancé whose wedding I recently described. This nourishing, accepting and all-encompassing feeling made me not want to wake up, but stayed with me once I did. The dream began with me in my early twenties but looked forward in my dream thoughts many years and actually incorporated someone from my real future. As I pondered over its meaning, I understood the “future” person as I never had before. That was instructive, but more important was a shift that had happened. Like many people who have had abusive childhoods, I have felt like an orphan, bereft of care, human and divine. As I did the dishes the evening after the dream, I knew that this was over. My heart felt as if it were shattering. Not breaking. I wasn’t sad although I cried. It was opening up. It had to be bigger to accommodate what it would now have to hold – another part of me, repossessed at last. How can I break the news to Best Bed, the black Hemnes bed from Ikea, so solid, so high, so comfortable, that its second-best Sleep Country cousin has bested it in dreaming? This entry was posted in ageing, dreams, humor and tagged abusive childhood, ageing, mental-health, neural pathways, Norman Doidge, peace, resurrection, sanctuary, self-cultivation, Shakespeare's descendants, Shakespeare's will, tai chi, THe Brain That Changes Itself by joyceahowe/hood. Bookmark the permalink. Going to try out my second best bed tonight!